^ Lee Davis,Jerome Davis 2004,p. John S. Langford "Triumph of Daedalus" National Geographic August 1988, pp.190-199. Paul Wahl "Who Will Take Aviation's Richest Prize?" Popular Science No.204 Feb.1974,pp.90-93,136-137. "World's First Aerial Bicycle Flies" Popular Science ,Oct.1923,p.41. Paul Whal "Man-Powered Planes Get a New Lift" Popular Science Mar.1972.pp.67-69,148. Paul Wahl "Man-powered aircraft shatters flight records" Popular Science May 1977,p.16. "What's News ￡50,000 prize for man-powered flight" Popular Science Aug.1973,p.55. Paul Wahl "The winner" Popular Science Jan.1978,pp.56-58,114. Paul Wahl "First really promissing U.S. man-powered aircraft" Popular Science Oct.1977,pp.122,123. Jack Lambie "Jack Lambie tells his story of the Gossamer Condor" Aeromodeller Mar. 1978. Ron Moulton,AAP Lloyd "The Gossamer Albtross" Aeromodeller, Sep. 1979. 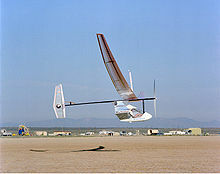 "DAEDALUS Project Milestone First Test Flight for Michelob Light Eagle"Human Power issue 18 vol.5 No.4,1986,pp.1,4. Ian Sims "Skycycle" HUFF,Issue 5 Vol.2 1999,pp.2-4. Mark Drela,"Low-Reynolds-number airfoil design for the MIT Daedalus prototype: A case study." Journal of Aircraft Vol.25 No.8 1988, pp.724-732. Kouichi Nakamura "Human Powered Aircraft of Japan",The Human Powered Aircraft Group Symposium Held at the Royal Aeronautical Society, London 16th January 1992. "The Feasibility of A Human-powered Flight Between Crete and the Mainland of Greece Final Report of the Daedalus Proect Woking Group",1986. Alan R. Campbell, Andrew J. Weinert, Jason C. Slaby, Kirk P. Miles,Nathan T. Depenbusch, Kevin T. Show "PSU Zephyrus: Design Of A Human-Powered Aircraft For Sport",AIAA Region I-MA Student Conference 2009. Jesse van Kuijk "HOW A HIGH-SCHOOL STUDENT BUILT THE FIRST DUTCH HUMAN POWERED AIRCRAFT",28th Congress of the International Council of the Aeronautical Sciences,2012. William Staruk, Benjamin Woods, Benjamin Berry, Graham Bowen-Davies "DESIGN AND FABRICATION OF ULTRA-LIGHTWEIGHT COMPOSITE STRUCTURES FOR THE GAMERA HUMAN -POWERED HELICOPTERS",2012. Todd Reichert "Kinematic Optimization in Birds, Bats and Ornithopters",A thesis submitted in conformity with the requirements for the degree of Doctor of Philosophy Institute for Aerospace Studies University of Toronto,2012.